It was a long road to getting all of the parts of Mandroid. I finally found the last two figures to finally build Mandroid. He is big and impressive. Let’s look at the last two figures on our way to the big guy. He is a big, tough version of Cap. He has a lot of detail, and I found the paint to be pretty good. He comes with his shield, which can be placed on his wrist, or thrown on his back. He comes with the really good articulation we have come to know from the Marvel Legends line. Double joints in the knees and elbows. The leg joints are pretty soft. I am not too keen on the rubber use that makes the knees and elbows. The knees on my Cap are pretty loose. I am expecting to find him laying on the ground quite often as he will no doubt loose his balance and topple over. We have seen a lot of Cap’s as of late. I don’t think I would have picked him up if I didn’t need the Mandroid part. I think the movie version of Cap was pretty spot-on, so this is not that big of an addition to my collection. Guess we will see what happens with the transition to a new Captain America. I am not a huge fan of Black Widow in the Marvel movies. Scarlett Johansson is far from one of my favorite actresses, so I would have been fine if this had been a comic version, but the figure is okay. She comes with two heads. The long hair version above, and the short hair version below. She also comes with 4 hands. 2 open and 2 grasping. I cannot believe they would give us a Black Widow and not give her some weapons. She has molded in guns on her hips, but that is all. She has the same good articulation as we get with all of the Marvel figures. It is hard to get her into poses. She has skinny body parts and high-heeled boots that make it tricky to get her to stand on her own. The outfit has so much detail close-up. Six parts all in a pile. This time I didn’t have to option to begin building Mandroid early. Black Widow had the torso, and as she was my last figure, I just had a bunch of parts waiting around. But from the size of the arms and legs alone, I knew this was going to be a big figure. He is so easy to snap together, and then he can begin to wreak havoc. The only problem I had with him was the paint on his chest. It is a very big chest, and the plastic from the front of the box rubs against the eagle stamp. When I found Widow, there were two, and I took the one with the least amount of damage to the paint. 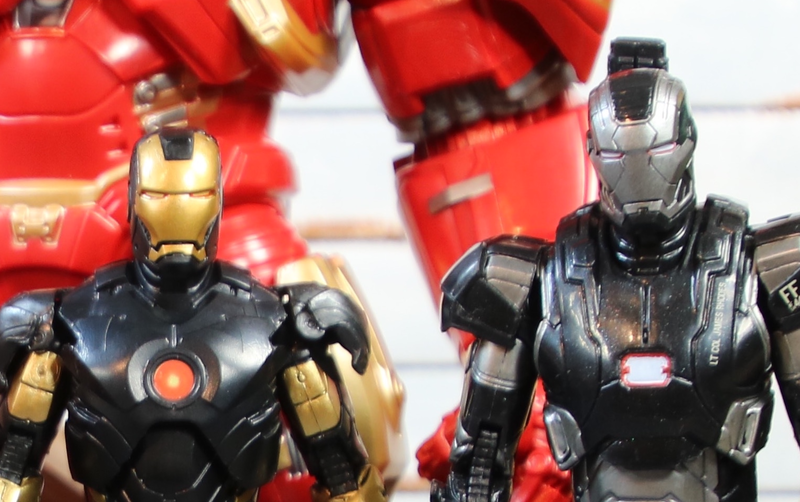 He shares some of the same parts as the previous release Iron Monger. From the abs down to the ground is the same, and they reused the fists. The torso, arms, and head are new. He is a great figure. Well worth the wait and all of the hunting. If you are still looking for parts, don’t give up, he is worth it.